Well, another weekend, another Sunday night without Downton Abbey. 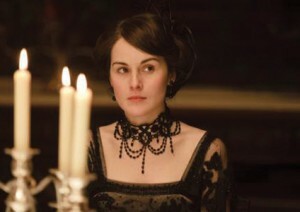 No eyebrow acrobatics from Lady Mary. . .
None of Lady Grantham’s knowing looks with pursed lips. . .
No shirtless Mr. Bates (no image available–thank goodness for that). I thought I’d be over Downton fever by now, but I’m obviously not. If we are going to be honest, Season Two was fabulous, but not perfection. I’ve been trying to pin down what was wrong and I think it comes down to pacing. The pacing of Season Two was a bit off–kind of like Julien Fellowes might have been hitting the Red Bull instead of a nice Spanish sherry while writing. How many storylines can one reasonably tell in six episodes? There is a difference between keeping a story moving and giving your viewers whiplash. My friend Molly forwarded me this article where Fellowes talks about Season Two and how he was influenced by the pacing of American television. Oh, Julien, my good man, please stop this foolishness! The time you gave the characters to gently steep into our hearts in Season One is what made us fall in love. But like Anna waits for Bates, I will wait for Season Three with hope that everything will right itself. What about you?